FREDERICK– Al Edwards and Pam Zusi, longtime supporters of Catholic education, were honored with the 2017 John McElroy Award Oct. 3 by the Friends of Catholic Education. According to its mission statement, FOCE is “dedicated to providing a Catholic school education in Frederick County for all who seek it.” Since its founding in 1989, it has provided more than $5 million in financial assistance to Catholic schools and students in the county. Edwards and Zusi have been a big part of that effort. Zusi was the first director of alumnae relations for her scholastic alma mater, Stone Ridge School of the Sacred Heart in Bethesda; served in development at Hood College; then returned to a Catholic campus as director of development at Mount St. Mary’s University in Emmitsburg. 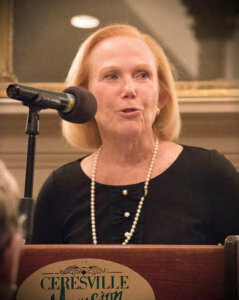 After her retirement in 2010, she held board positions at Visitation Academy in Frederick (which closed in 2016) and St. John’s Catholic Prep in Buckeystown, and serves as chairwoman of the Frederick County Catholic Schools Coordinating Committee. Zusi is also instrumental in aiding those with disabilities, a passion that began when her granddaughter, Meredith, was born with a genetic condition, Trisomy 8. 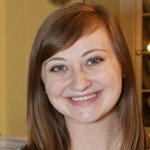 Meredith is now 19, and her grandmother is active in L’Arche, an international organization that creates and supports housing for those with disabilities. Zusi is busy preparing for a major fundraiser for the Friends of L’Arche Frederick, the Let it Shine Extravaganza Oct. 14 at St. Katharine Drexel Parish in Frederick. The event will feature professional musicians performing alongside those with intellectual disabilities. Edwards attended Catholic grade school, DeMatha Catholic High in Hyattsville, and then Mount St. Mary’s University. He rose to the rank of captain in the U.S. Marine Corps, and worked as an executive for several cosmetics companies. After moving to Frederick, Edwards served on the boards of DeMatha High and St. John’s Catholic Prep. 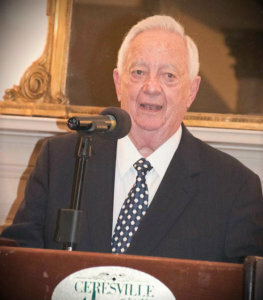 He has been a member of the board of FOCE for 16 years, and was its president for five. Edwards noted that attending Catholic schools for 16 years cost his parents approximately $2,800. Today, that same education runs in the vicinity of $300,000. “That is why Friends of Catholic Education exists,” said Edwards, explaining why he and the other supporters of FOCE are dedicated to helping children who could not afford a Catholic education otherwise. The John McElroy Award honors the Jesuit who founded what is now St. John’s Catholic Prep in 1829, served as one of the first Catholic chaplains of the U.S. Army and founded Boston College. “We are happy to be able to support them,” said Michele Corr, executive director of FOCE. 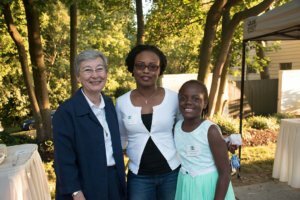 Attendees at the awards dinner at the Ceresville Mansion included Elizabeth Fernandez, a sixth-grader at St. Thomas More Academy, and Briyel Alao, a second-grader at Mother Seton School, both recipients of FOCE scholarships. Fernandez is the second of seven children; five currently attend St. Thomas More Academy. She enjoys Lego robotics, learning piano and playing on the boys’ baseball team. At Mother Seton School, Alao enjoys her gym class and technology class. Father Brian Nolan, chaplain of Mount St. Mary’s University, delivered the keynote address. He highlighted what he called the two greatest aspects of Catholic education – to share the Good News and to be the Good News.